Proof-Reading.com provides comprehensive editing services for résumés, curricula vitae, and cover letters. Before the serious job seeker submits documents to a prospective employer, he or she should have them reviewed by a professional editor. Your résumé/CV and cover letter are not only informative documents, but inherently persuasive ones as well. Our professional editors make sure that your documents effectively "sell" your skills to a prospective employer, whether corporate, government, or academic. In reviewing the components of your employment or tenure packet, for example, they will correct errors in spelling, vocabulary, grammar, and English usage, adjust formatting and layout, and modify organization as needed. 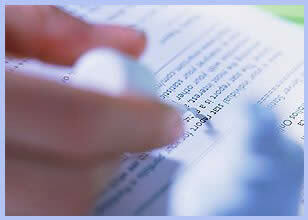 Your documents will be clear, concise and flawless! Furthermore, our editors can help you tailor your résumé/CV and cover letter to specific job opportunities. Selection of details, organization, word choice, etc. are all affected by the type of job for which you are applying. Given information about the job, our editors can customize your job market materials for a particular audience.